If this is real, it's just 'too' cool. Very cool John... I hate being a skeptic.. So I am going to just say awh.. That is soooo cool... Maybe the birds are cool or maybe someone is talented and made something cooler! Interesting ... I think need to pay more attention to birds on wires. Oh man, what a mess this has caused. First, "The Birds" filed a suit against Jarbas Agnell and filed a complaint with Youtube.com for copyright infringement. Next the Hitchcock estate filed suit against The Birds for calling themselves "The Birds." My understanding is that Roger McGuinn of The Byrds is now consulting with attorneys to consider his options. The music business sure has gotten complicated. Oh, it is probably quite real. 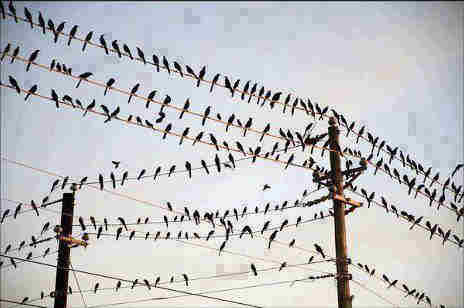 Now, if someone was claiming that some birds on a set of wires had come out sounding exactly like Bach's Sinfonia from Cantata #29, then I would suspect a hoax. Not that it would be impossible, mind you. Just so highly unlikely (and requiring one heck of a lot of birds). It probably took taking a few pics on different days to actually get something nice sounding. For those who read and/or know a bit of theory though, notice that the person decided that birds only indicate notes that are the space above a line. They are obviously using a G clef, and that would restrict the possible notes to F, A, C, E, G.
So possible combinations of notes as chords would include F Major, A minor, C major, and some other useful combinations. So it would be more likely to sound a bit "musical" than if the person had included the lines somehow, since a good number of unpleasant dissonances are avoided. You wouldn't really need to look for birds either (though it is an element of fun, if you just happen to live near somewhere with 5 parallel lines they like to perch on like that). You could just take a piece of score paper (or draw 5 lines) and close your eyes and make a bunch of dots with a pencil and use those to generate notes by the same "rules". It is not at all unlikely you would come up with something that sounds at least as musical as those birds did, if you make a few tries. Hopefully that suggestion won't put too many birds out of work, though.. "Times is hard.."
Very interesting. The office printer has blemishes on the page in a cyclic nature. After hundreds of pages printing then refining it down to notes on a page, I realized it was "hail and farewell". I was then called into the boss's office. Great find John, and very cool! One thing to keep in mind is that the perched birds make up only the spaces. It will sound similar no matter how you mix it up. Lets not let reality ruin it mate. LOL at the bugs too. good morning snicker with my coffee... to ease the pain of being at the office on Saturday... 3 hours 59 minutes to go. This one must be a "symphony"
hahahaaaa! Anyway it's good and i like it, whatever the truth is - it sounds nice. Thanks for sharing!